If spiritual gifts are special divine empowerment to do ministry, then it would seem important to have people with the best fit in the various ministries. While you can list the gifts needed for the various positions on job descriptions and administer a spiritual gifts test prior to placement in ministry, sometimes people’s gifts aren’t obvious until actually in ministry. Staff evaluations provide a venue for stepping back and asking if the ministry seems to be a good fit for the individual. 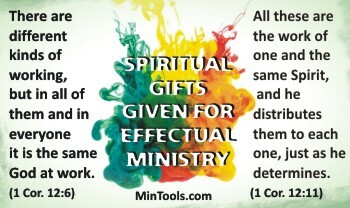 Look at the typical characteristics of the spiritual gifts needed for the person’s ministry. Are these traits evidenced? Are they addressing the issues and needs people gifted accordingly would? Look at the person’s feeling toward the ministry. If discouraged or unfulfilled in the ministry, perhaps it could be from trying to fit a square peg into a round hole. We usually have a sense of fulfillment when doing ministry in accordance with our gifts. Look at the results or fruitfulness of the person’s ministry. Whatever effect the various gifts produce should be happening. For example, if a person has the gift of exhortation, people in the ministry should be getting encouraged or built up. If a person has the gift of service, tasks that need to get done should be getting done. If someone has the gift of teaching, people should be learning. And on we could go with whatever gift might be needed for that ministry. What if the Staff Evaluation Reveals a Poor Fit? God may still use the person, providing His power through means other than the person’s spiritual gifts. If, however, the person feels discouraged or unfulfilled, it could eventually lead to trouble. Generally, though, we must consider God’s intent in distributing specific gifts to individuals. Isn’t it that they be used? Consequently, the best plan could be to find a better fit — to the benefit not only of that person but also the ministry. Begin by praying for God’s will for the person and for the ministry. Also pray for God’s timing to make any changes. We must be careful not to short circuit His intent to use the person despite gifting. God may be seeking to accomplish something in the person or within the ministry, taking either to a place they wouldn’t get otherwise. ← Previous Previous post: Organizational Structures Help or Hinder?